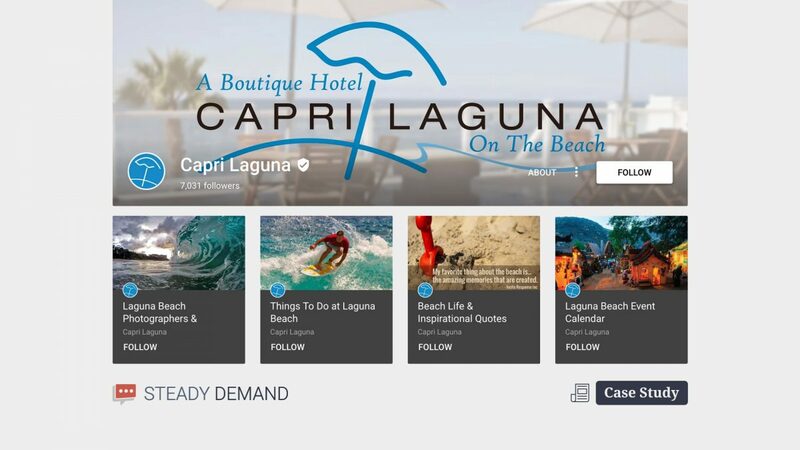 This case study of Capri Laguna Hotel showcases how powerful the right social media marketing strategy can be for a local business. When Capri Laguna came to us they needed help. They had recently undergone major renovations and were situated directly across from a 5-star hotel in Laguna Beach, CA. These were all things our team was capable of doing and had a track record of accomplishing relatively quickly. We recommended our Google Plus Booster product, and began building their Google+ presence from scratch, posting highly targeted content daily. Yes, that’s right– Google+. The network that nobody takes seriously yet is a literal gold mine for organic local search. A year and a half later, we’re happy to see they have close to 7,000 followers and a significant amount of activity around their Google+ posts. One of their collections (Laguna Beach Photography) was actually “featured” and has close to 100,000 followers. Posts to this category average several hundred +1s each and are a great way to create awareness around the beauty of Laguna Beach. So, what about tangible results? Bookings are up year over year and continue to climb. 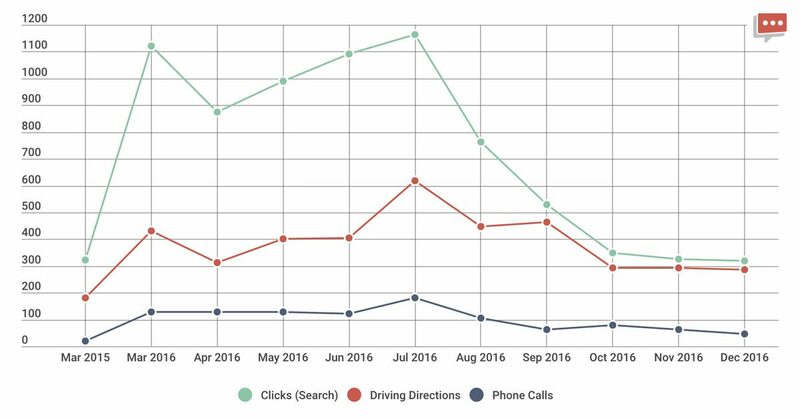 The number of calls and driving directions increase monthly. They transformed from a 2-star to a 3-star hotel and this is the only online marketing that they engage in. They were recommended on Gibson International as a direct result of our Google+ efforts. 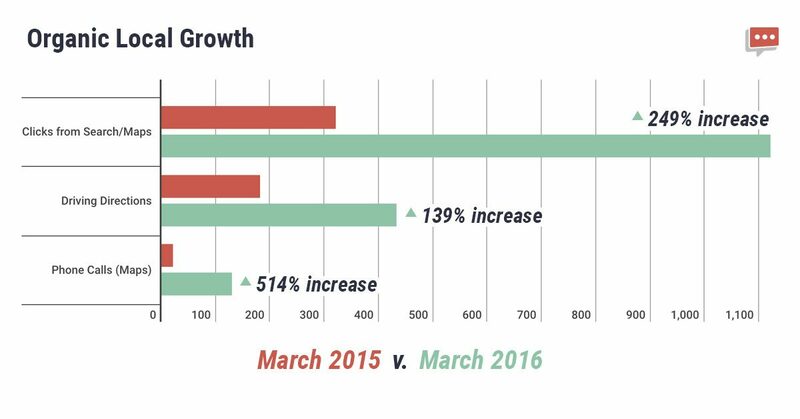 Not only were we able to significantly grow their local reach year-over-year, but we were able to maintain and build upon that higher level of reach in the long-term. Here’s how we tracked the growth over the course of 10 months, showing how the trends lasted from the busy season through the slow season. While this chart may seem to drop near the end of the year (the slow season) it’s important to note that even in the slowest time of the year, our efforts still had them busier than their busiest months the previous year. It’s important for our clients to know that Google+ activity is not like any other network– it has a profound effect on external KPIs that drive business. Again, keep in mind, this is with a focused effort only on Google+ marketing. Correct Google listing the hotel as a 2-star hotel in the knowledge graph to a 3-star. Help monitor for new reviews so they can respond. Keep tabs on the website for errors as we go about our day. Write blog posts on a regular basis. The team at Steady Demand delivers on their promises. They consistently keep my presence on Google up to date, keep me in the loop on the ROI, have help ensure that my local listing is working so I can go about my business without having to keep an eye on them, I know the work is getting done. More importantly, I can see the return on investment, driving directions are being requested, real people are talking about us and our following grows every month. Google Plus has helped us stay connected with our customers and helped people find us in new ways across all of Google. In addition, Steady Demand also pushes our content out to other media, which helps us stay engaged with our customers and create a value for this partnership. Ben, Christine and team do a phenomenal job with our google+ page, and managing our social media platforms. 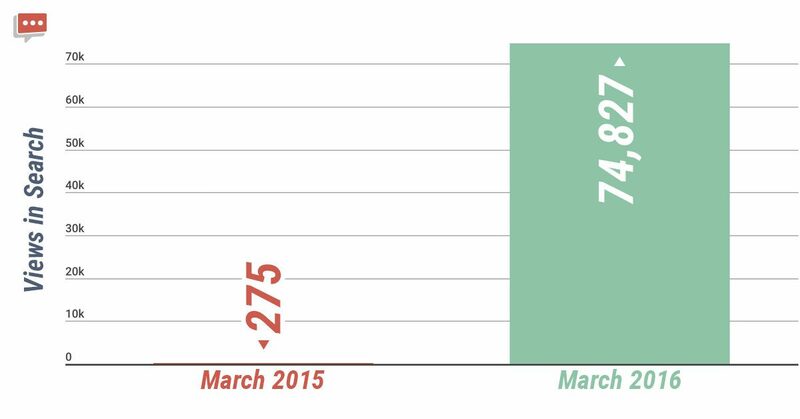 With their help, we have seen engagement increase exponentially and our revenues are at record highs. I appreciate their willingness to work with clients more hands on or hands off, and with me, I am mostly hands off and they manage and control our site professionally. I would recommend them very highly! Wouldn’t you love to be able to say all this about your social media marketing agency? Why not send us a message and we can start the conversation about making this happen for your business.